Casio Privia PX-780 Review: Worth Buying in 2019? Casio PX-780 Review: Worth Buying in 2019? Casio has managed to overcome their past by creating a line of truly impressive models while still keeping the cost down. They have done an impressive job of creating digital pianos that are affordable for every budget and that meet the needs of the novice and the advanced player. 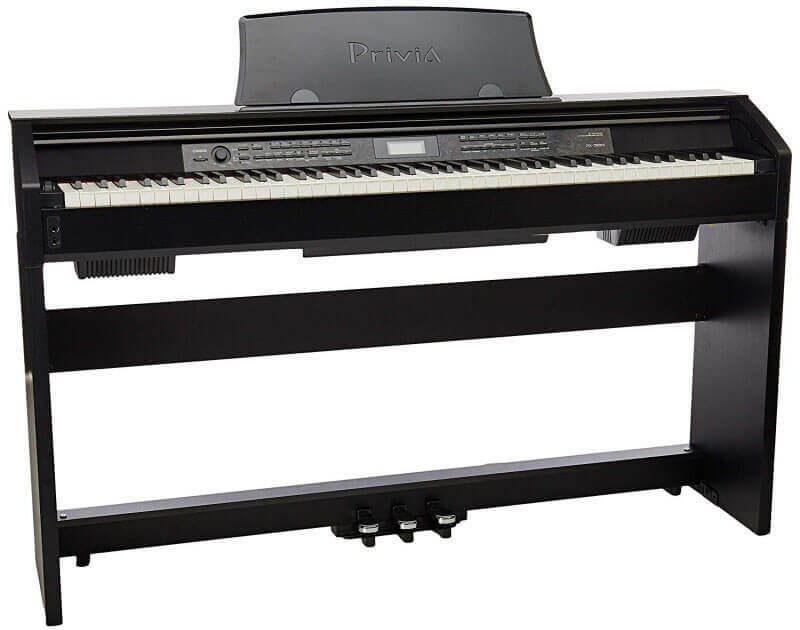 In this Casio PX-780 review we took a look at the Privia Line (specifically the PX-780) to get a better feel for this piano and so that we could help you to make an informed decision about which piano would best meet your needs. The PX-780 is a really impressive model at its price point, it’s arguably one of the best digital piano models under $1000. Casio lost some image points in the early 80’s to the mid 90’s because they made a couple of faux pas and lost some credibility by trying to make instruments that were super affordable but turned out to be little more than toys. They have really cleaned up their act so you should give them a second look if you have not looked in a while. They are quickly becoming a force to be reckoned with in the instrument industry. Today Casio is widely known for producing some of the best cheap keyboards and pianos. The Privia line is proof positive that Casio can stay true to their affordable roots and still create very impressive instruments. Don’t let the price tag fool you. Just because you can save does not mean you are going to sacrifice. 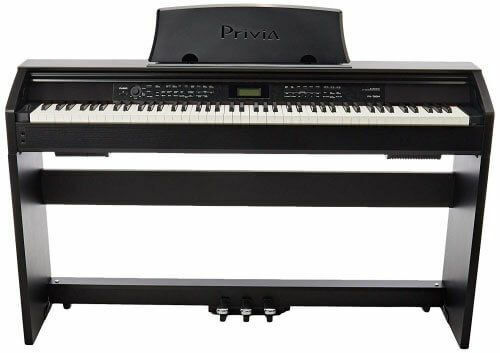 The PX-780 is an electronic piano that is part of the Privia line from Casio. The Privia line is actually their high end line. It comes with a furniture grade cabinet that would complement any décor. Our first impression of this digital piano was that it is surprisingly well made. It is not a portable digital piano. It is not really well suited for the stage. It is not something you can take with you. A lot of people are looking for a digital piano that they can take with them on the road or to practice this is not it. It is not really well suited for the stage unless it is going to be stationary like for a church or even as a permanent fixture in a theatre. This is more like an upright piano that you use in the home or the studio. It can be dismounted from its cabinet but it is built to be in the cabinet to realize its full function. If you are looking for something portable this is not for you. We just want to be honest with you so that you do not waste time learning about this digital piano only to find out it is not what you are looking for. Anyone that wants an upright piano that is electronic. Anyone that is short on space. Anyone that wants a practice tool. Anyone that wants an upright but does not have upright money right now. If you are looking for a digital piano that can have a permanent space in your home than this would be great for you. If your space is limited or you live in an apartment this would be a great solution for you. If you want a reliable practice tool this would be great for you as well. If you really would love an upright piano or a baby grand but do not have the money to invest this is a great substitute. We are going to start by providing you with all the specifications and how they affect your play. First thing we noticed was the practical key activity with new and enhanced graduated weighted style for the keys. On this model the keys more accurately channeled the feel of an acoustic piano because of the graduated weight design on the keys like an acoustic piano. It was a nice touch that we found really helped with our playing. Casio has put quite a bit of work and design into the keys on this model to give it a really authentic feel. Casio really knows how to make good weighted keyboards for their pianos. It not only feels like an acoustic piano but it plays and sounds like one as well. Casio has added the Tri-sensor dynamic reaction key activity to offer a more piano stable type reach and expression. This is a really unusual find on a piano at this price point when you compare it to the Yamaha Arius which comes in at about the same price but that has left off this feature. Each key has 3-key sensors which will have a major effect in “musical shading” of sound and your capacity to express your music on this keyboard. This is a pretty impressive feature at this price point that you really do not find in other models within this range. It really speaks to Casio’s commitment to bring extraordinary features at affordable price points. The keyboard is nice and quiet. You do not get that clicking or clamor that you find on other models when the keys are being played. The keys are smooth to operate and so is the sound. Another surprising bonus on the keyboard is that the keys are made of engineered ivory which is textured for great finger development. It is the little things that really make a difference. For the beginner that textured key feature can really help out it keeps the fingers from slipping and make moving around the keyboard a lot more productive. That’s why the PX-780 is a very good digital piano for beginners, if you can afford the price. The keys are plenty to gush over because frankly with many models the sound is there but so is the clicking and clamoring of poorly designed keys. We were impressed what can we say. Let’s just move forward and talk about the sound. The Privia PX-780 contains one of the better solid frameworks found on the Privia line. Casio has enhanced their already major winning sound framework by executing a more up to date one, called the AiR sound source, or the Acoustic and Intelligent Resonator. This sound framework utilizes more than triple the memory produced by the past generations of models and gives a much more full solid sound, especially when it is connected to output speakers. It offers a full 128 of polyphone with great reverberation. The two 20 watt speaker system really highlights all the features that this piano has to offer nicely. There are three pedals that also enhance the sound and play of this digital wonder. This model offers over 250 nice instrument sounds, 360 piano voices and a slew of other musical features that are easily accessible for practice, recording and composing. The USB port allows this model to be a great MIDI controller for all your laptop, Ipod, or portable workstation. It offers a wide range of applications that are easy to use thanks to the easy to use LCD display screen that is intuitive and easy to use. You can easily connect an amplifier, save files in the tremendous memory store and use the piano learning strategies that are included. Most beginners have reported that they found that this digital piano has been a really helpful learning tool. While it does offer some very advanced features Casio has done a fine job of keeping them all easy to use so even the greenest of novices are able to quickly learn how to navigate the piano and start using the advanced features. You can easily layer any two sounds at the same time from any place on the console. It also has a great 4 handy play feature that is made for 2 people to play at the same time. This model is all about having fun and really enjoying the music. There is a board control lock to ensure that there is no accidental erasures or mixing messes. There is an automatic stop for when the keyboard has been left alone for two long which of course saves energy but more importantly engages the automatic lock to avoid any mishaps. This model is really chock full of high end features that we could not possibly name all hear. What Can We Say Negative? We looked and looked to find something that we did not like about this piano but we just could not seem to find the deal breaker. We could not find a reason not to recommend this piano, it does everything that you can possibly want a piano to do and then some. It is the perfect digital piano for both the novice and the experienced player. It is a great value at any price. It is perfectly priced and easily give the competition that charges two to three times more a run for their money. If you are in the market for a new piano you would be amiss to not consider this piano. It is the perfect piano for your home.